We have already ordered the floor tiles (heritage star blue which you can see in the moodboard) and wall tiles are a matt off white rectangular tile that is slightly bumpy, there will be a medium-dark grey grout and a slate coloured tile trim. We'd really like a wood vanity unit and countertop basin preferably in a darker coloured wood and really like the one shown in the moodboard from bathstore. We are really stuck with tap choices - we really don't want chrome as would prefer something with a matt or brushed finish, I have put black taps (noir collection from bathstore) on the moodboard but now I think there is too much black! Bit nervous about a copper or brass colour although it would add some warmth but worried it might look a bit naff. The other thing is that there will inevitably be some chrome in the bathroom (frameless shower enclosure and plugs for bath and sink, also flush on toilet) but we would like everything else (basin and bath taps, shower head, towel radiator) to match in colour/finish - and preferably not be chrome! I'm struggling to achieve this especially when it comes to the towel rail. I found this brushed steel tap collection: https://www.drench.co.uk/taps/shop-by-finish/brushed-taps which I do like the majority of but I don't like the tall mixer tap for the basin which would be our preference over a wall mounted tap as don't want to have to bring the wall out any more. Also not sure about the dark shower tray. Plan is for a slate-effect stone resin shower tray (not keen on white acrylic shower trays) and I thought it could complement the slate coloured tile trim nicely but is it a bit much? 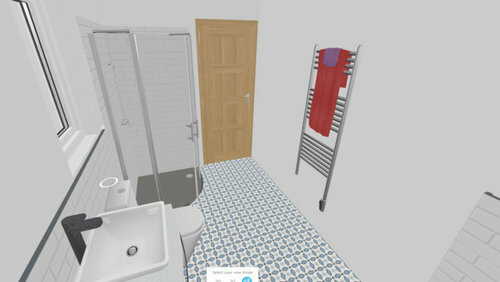 I've also attached some pics of the layout of the bathroom - does the wall tiling look ok or would you change it? 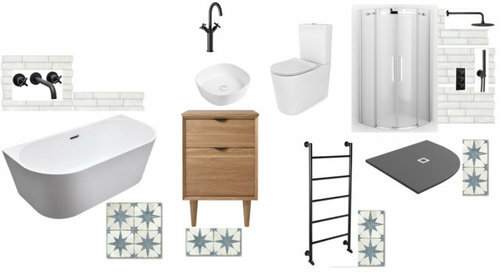 Any tap/shower tray advice or just general comments/helpful criticism of moodboard is welcome! Wood vanity unit or Floating shelf option as for taps i think the Ramore tap from Aqualla would complement your colour scheme greatly. Our slate trays would look great too! if you went for a straight edge tray you could complement it with Crittall inspired shower screen. Your mood board looks great! I think ultimately you need to feel happy and comfortable with your choices and if you like black then go for it. The black accessories you have chosen are not overbearing and works well with the rest of the items. The only thing I would give caution to is the black shower tray, unless you keep it spotless I think you will see a lot of limescale marks. If that is going to bother you I would go for white or as per Danny's suggestion check out the slate trays. 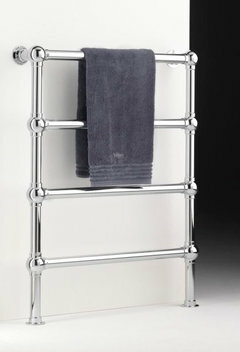 You could place some hooks above and hang your towels which would look stylish and still give your bathroom warmth. ooh love the ramore tap, just googled it! bit pricey though - unfortunately we can't have a square shower we can only have a quadrant one as need to access it via the corner because of toilet and door position! 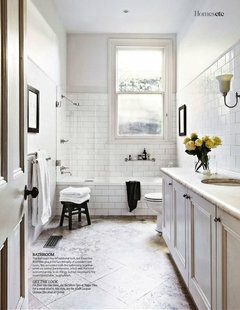 Hi Heather, this looks like a bathroom from a dream! 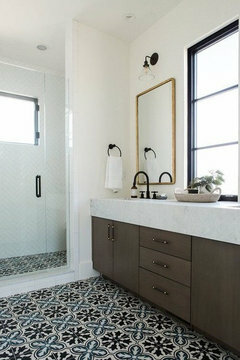 The tiles are amazing and will be a big design statement! So we suggest tiling the entire floor by creating a wet room. That way you can skip the shower tray. The space will look even bigger. 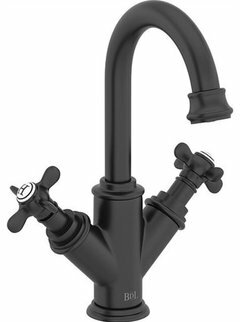 We would go with all black taps, because they match the style you have chosen perfectly. 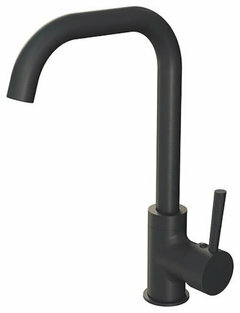 You can find some great black basin/bath taps and showers in black finish on the link below. As for the heated towel rail, we suggest going for a neutral white one, because it doesn’t have to be emphasised with a contrasting black colour. 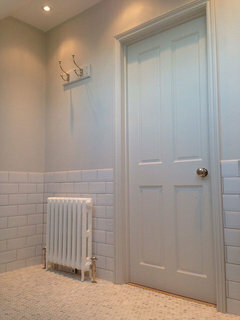 In white finish it will blend in nicely with the wall and let the tiles and taps speak. We would also do half-way tiling on the entire wall behind the heated towel rail and not just where the bath is, so that it flows around better. You can find some great floorstanding vanity units in darker wood on Tikamoon website. They are quite special and very spa-like, so not your ordinary bathroom vanity. Hope this helps, good luck with your renovation! No Chloe that was really helpful thank you. I have to say I have been having second thoughts about the shower tray and the trim. I made a snap decision about the trim in the tile shop and I’ve already ordered it and unfortunately it can’t be returned - will see how it looks but may change my mind about it. thanks design angels - have rejigged it so no shower tray and full wall with half tiles - agree looks better, just not sure what to do about the towel rail, it looks a bit odd being half on, half off the tiles? also done another mood board - one with brushed brass taps and one with the ramore taps from aquaria - loooove the ramore was but think thy might be a bit too square and not fit in with the rest of the bathroom? Oops images didn’t attach to previous two posts! Great, looks perfect now! If you are concerned about the heated towel rail being installed somewhere in between tiles/wall then what if you opt for a floorstanding one? It will be a bit smaller, but will only cover the tiled area. Or you could do 3/4 tiling, that is very popular at the moment. See some photos attached..
Do you get limescale? If so, beware of matt black anything and especially those slate effect trays. If you have a limescale issue then brushed nickel or brushed steel would be my choice for brassware. Silver so doesn’t clash with chrome but softer and matt. Check out Crosswater, Arteform and Justtaps Inox range in these finishes. The tile trim will look fine if you’re going dark on the walls so depends on paint choice. 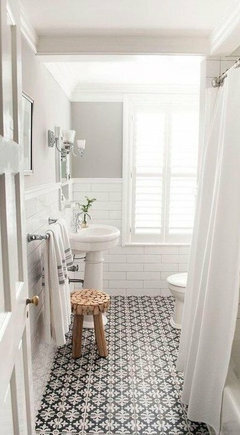 With two windows and all the white I reckon a dark paint could look fab and tie in perfectly with the tiles. Spot on mini pie with the dark walls! The window above the bath is south facing and window above loo is west facing so yes plenty of light. We'd probably get a dark grey or blue to complement the floor or the taps. 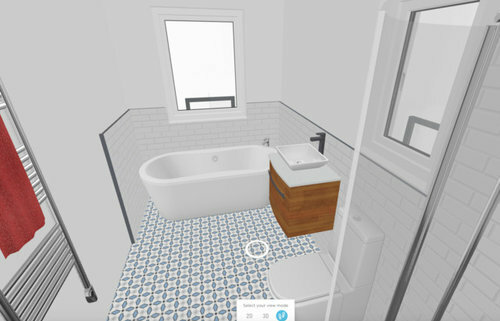 I think my homebyme screenshot is making the bathroom look very masculine at the moment but hopefully with the actual tiles and vanity unit we are getting it will be more of a mixture! Looking good! 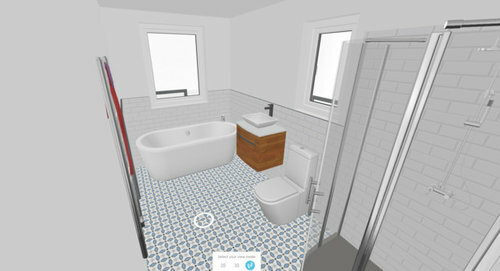 Good luck with your bathroom renovation project! Show us some photos when it’s done.. I love those crosswater taps on one of your mood boards. I wanted wall hung taps in my bathroom as I think it looks very smart and a total dream to clean. However they do require space and different plumbing. You are nearly there! Haven't read the comments, but like to ease your mind.
" The other thing is that there will inevitably be some chrome in the bathroom (frameless shower enclosure and plugs for bath and sink, also flush on toilet) "
All of these come in stainless these days. Or brushed nickel. And more. Thank you guys for your helpful advice and comments. Chloe yes I love wall mounted taps too, we are definitely getting wall mounted for bath but I don’t think we can for basin as it’s an external wall so unless a plumber can do something very clever we’d probably have to put some extra studwork in there which would reduce the width of the room which we can’t do unless we made the shower smaller than a 900x900 quadrant which we also don’t want to do! I love the crosswater brushed brass taps, but I can’t seem to find a tall basin mixer tap version of the range, and we need a tall mixer tap as we’d love a countertop basin. It’s so frustrating when the companies don’t do all the different types of tap for that range, some of them I find don’t do showerhead versions either so you can’t match it all up! Have a small section studded, just like you would a hanging toilet? Small edge and mirror above? Retain and reuse bath and taps? 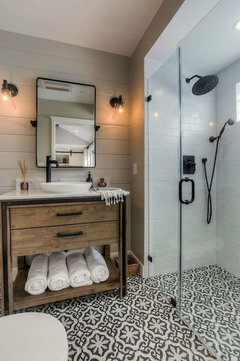 Wall mounted or deck mounted taps? Kitchen Taps - Help !!!! Black taps & showers - are they a nightmare to clean?